Create a file server usage policy that defines how users should manage their folders and files. Be sure to specify what types of files they should store on file server and what they shouldn't; how new folders should be created and how access should be assigned to them; and the penalties for not following the policy. Use centralized data folders to better manage your data and simplify backup. Segregate your file shares by department. Create one global folder where users can share files across departments, and create a script that cleans up that folder automatically every day. Regularly review the contents of your file servers. Pay special attention to the largest files, and look for duplicate files and empty folders. 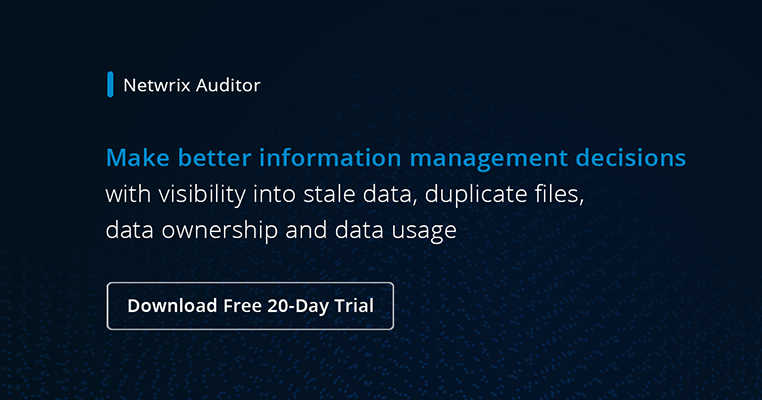 Analyze the results to identify any files and folders that do not comply with your file server policy, and work with the data owners to either delete them or bring them into compliance. Try to classify files by type storing the same file types in one folder. Regularly report on file extension statistics so you know which types of files you have the most of. Deploy e-discovery tools that enable advanced searches of your file shares for legal and other business purposes. Identify files that have not been accessed for a very long period of time (six months or a year) and work with the data owners to archive or delete them, as appropriate. Protect your file share with regular backups — at least one full backup every month and one incremental backup every day. Remove ‘Everyone’ permissions from every resource except the global folder designated for file exchanges. Assign Full Control permission only to the Administrators group and strictly limit membership in this group. This permission enables a user to manage application software and control user rights.